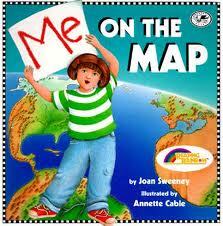 I have read "Me on the Map" by Joan Sweeney to my first graders and it is a hard concept for them to get! I have tried over and over for them to understand where they live, what the state is called and where we live in the state. Whew! That is all I can say to describe it! (It's almost as hard as looking at the world on a flat map and telling them they can't walk off the world!) I decided that I have to take a new approach! I was on http://keepcalmandteachon.blogspot.com/ who has a brilliant book idea I borrowed :). Thanks Keep Calm and Teach on! So, I live in the state of NC which is a wonderful state with lots of fun things to teach about! I adapted her idea to the state of NC. It goes with the theme "North Carolina, North Carolina, What do you see?" It was pretty fun to make and I can't wait to use it in Social Studies! The best part: They can keep the book for their library! I am going to post it on TPT for Free (of course) feel free to download it! Also, if you have a state book that you use or make, link it up for other teachers!! !